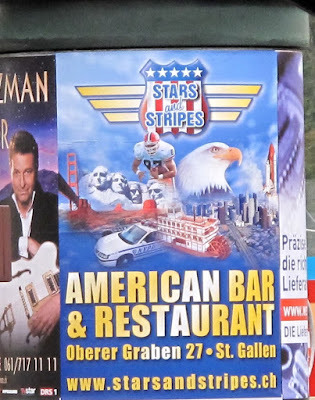 Of course, the Frau has been to the American Bar & Restaurant–on her birthday, of course. But you wouldn't expect any less of her, oder? For her first impressions of the restaurant, click here. Now let's see. What do we have in this fantastic logo? Football (an Illini player, they have good taste). And a bunch of presidents that are larger than life. I'd say they did a good job summing up America. The only thing that could possibly be improved would be the addition of a big lawyer right in the center of it all (did you know a 4-year old can now be sued for negligence?). Sadly incomplete. They forgot the riding mowers with cup holders. And guns. I don't see ANY guns! Right. Someone should tell them before this gets out. Chantal, have you read Bill Bryson? In one of his columns, he explains why cup-holders are so important in the US and why it's actually a selling argument for cars. It's brilliant. Of course, I love Bill Bryson. His book, I"m a Stranger Here Myself, is fantastic. Obviously the world's minimum upbeat nations are spots assaulted by war and great destitution - with Syria, Burundi and Togo having their spot at the base of the 158-country solid rundown.